Benidorm is a leisure and holiday town located on the southern Spain, 41 km. (25 miles) from Alicante on the Costa Blanca coast. The two main beaches of Benidorm; Levante and Poniente offer quality services, limpid water and fine sands difficult to find elsewhere in the Mediterranean. Benidorm boasts the most comprehensive and best equipped network of hotel and holiday accommodation in the Costa Blanca coasts. Benidorm has the fabulous Aqualandia Water Park where both adults and kids can enjoy a fantastic and joyful day out in Benidorm. Holidaymakers can also visit the animals of marine life at Mundomar which means "the World of Sea". They are both one of the best things to do in Benidorm. Also Terra Mitica is an ancient world themed park with variety of rides and roller coasters. Terra Natura is a great theme park and new generation zoo in Benidorm offering a journey to exotic places in Europe, Asia and America just in one day. The Old Quarter of Benidorm situated aside the promontory that separates the two Benidorm beaches. The Cerro Canfali headland that is veined by narrow lanes and alleys, converges in the light-filled Balcón del Mediterráneo belvedere, whitewashed and decorated with blue tiles, an ornamental motif repeated along the balustrade that graces stretches of the seafront of Benidorm. This small Old Quarter corresponds to the original fishing village and is presided over by the blue-tiled domed roof of the 18th century San Jaime Parish Church. In the area around the traditional city centre of Benidorm are the main shopping streets where holidaymakers may find and buy fashion items, handicrafts and souvenirs. 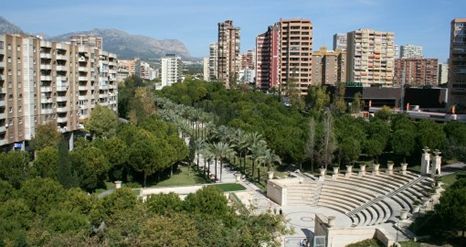 Occupying a large area in the middle of Benidorm is the L’Aigüera Park that is designed along Neoclassical lines by the architect Ricardo Bofill. Also there is ample opportunity for a quiet stroll along the 5 km. beach promenade with beachgoers and watersports-lovers enjoying themselves at the water’s edge. Similarly, the wide avenues of Benidorm, flanked on either side by tall modern hotel buildings, provide yet further possibilities for a leisurely stroll. 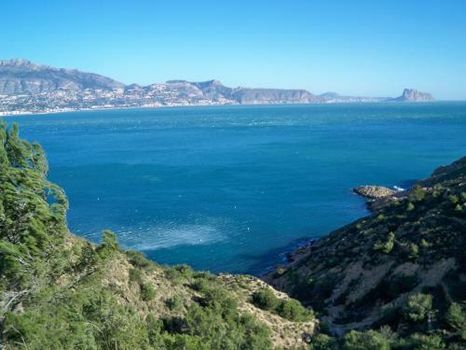 In addition; the Benidorm Isle, that is located out in the centre of the Benodorm bay, may be visited by boats leaving from the Benidorm harbour. According to locals, the islet of Benidorm represents the gigantic block of rock that is missing from the summit of nearby Mount Puig Campana. During one of Charlemagne’s warlike sorties, the intrepid Roland lopped off the mountain top with the blade of his sword, sending the missing piece thundering down the side of the mountain into the sea and so causing it to be transformed into the small island outcrop.